Ordo makes a good photo and a good point about where the relationship between technology and social interaction has gone. My dad calls smartphones "the electric bellybutton" because everywhere you go you see people looking down and constantly fiddling with their fingers. The smartphone really is a double-edged sword. The brick-built phone isn't the only impressive model here--it's an ensemble. 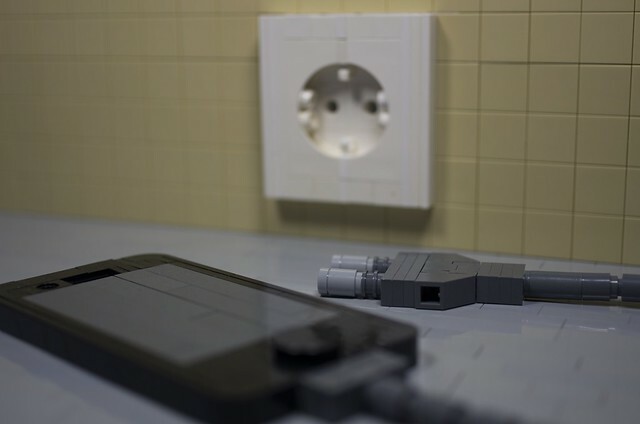 The tiled wall, the electrical socket, and the phone's charger look real to me and sell this photo.